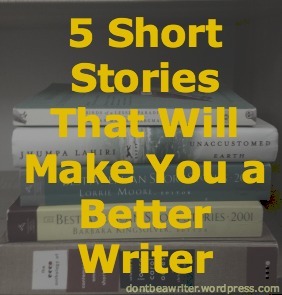 I selected the five short stories below for their diversity in style and subject matter, but also because each one is a well-crafted story in its own right. If you own any modern short story collections, some of these works are probably in there. Or, other works by these same authors will be. Which, by the way, if you are a young writer and you don’t own any story collections yet, I highly recommend picking up one from your local bookstore, or finding a used copy online. Even if you’re a novelist, short stories provide great quick studies into the how to craft an effective story. What it’s about: There’s an accident, and a child gets hurt. Why it’s awesome: It’s short and punchy. No, really, it will feel like someone punched you in the stomach. …I always forget to share these things!